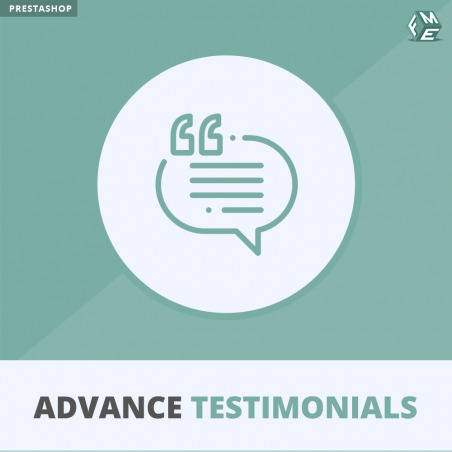 Advance Testimonials is the best PrestaShop Reviews module that allows you to display your customer’s testimonials to influence visitors and encourage conversions of your products and services. Buy this product and get money (1 points) in reward! 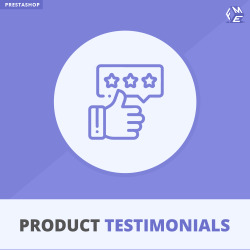 The Prestashop testimonial module is a powerful module that can help you to create trust in your customer's mind. The research and studies on customer behavior states that people like to read reviews and testimonials before making a final purchase decision. Limit testimonials description to certain words in which case “Read More” link will be placed. You can limit number of testimonials on a page (pagination). Includes quick “Add Testimonial” form which can be set to open up in a sliding manner or popup. This form includes all necessary fields to capture information including Website URL which can be displayed on front-end. Add upto 4 custom fields on “Add Testimonial Form” or customize existing ones. You can choose which field to show on frontend. This PrestaShop Testimonials add-on offers custom testimonials block. It supports multiple slider effects which can be activated. I had purchased this module after looking around for similar modules and chose this module due to the features that it has. Post installation there were a few issues that needed to be fixed. The FMM Team was very fast in responding to the issue and fixed it in 3 Hrs. Top Rating for Module & Customer Service !!! The module is good and the installation guide as well; you people helped me save my installation charges by uploading an easy installation guide with the module package. It was easy to install the module and now I hope it will increase my sales, which will obviously take some time. Good to see people posting reviews in my site thanks to advance testimonials. Module is good but support was taking more time in resolving my issue. They responded pretty quick took more time in resolving the problem. Great work! Thanks for making your testimonial module compatibly with my current theme which is does not support new modules.